Sent home to your parents too! (That would probably be a FERPA violation today.) As I said yesterday, they were not fooling around. Rice students had not yet become paying customers and so there was no reason to relax either disciplinary or academic standards to keep them around. Screw up or even start looking like you might screw up and we will make sure your parents know about it. Continue and you’ll wind up on probation–every semester saw long lists posted in front of Lovett Hall of the current crop of endangered students. If you didn’t fix it, out you went. Today’s a travel day for me, be back on campus tomorrow. Is it a postcard with a place for an address and stamp on the back? Posting a list of names would be a FERPA violation, too. Privacy is important, but fear of public humiliation can be very motivating. There must be a happy medium between where we were then and where we are now. Maybe that “happy medium” was in the 50’s. 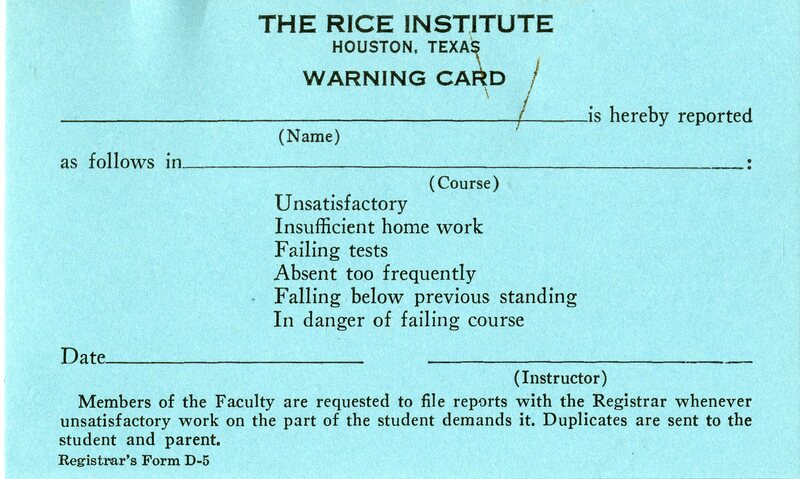 I don’t recall those warning cards or public lists, but the idea was still, for some faculty members, to flunk as many students as you could get away with. At that time, if you went on scho. pro. three times, you were out. In those days you were not considered legally “emancipated” from your parents until you turned 21, so it’s just like sending the parents report cards for elementary and high school.